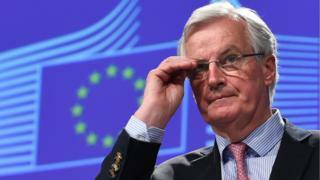 The EU’s chief Brexit negotiator Michel Barnier will address a joint session of the Irish houses of parliament later on Thursday. He is the first non-head of state or prime minister to make such an address. Mr Barnier has said he will be “attentive” to anything that may “weaken dialogue and peace” in Ireland. The EU negotiating guidelines state that issues relating to the Irish border will have be resolved in the first phase of its talks with the UK. The guidelines call for “flexible and imaginative solutions” to avoid a hard border. But they caution that any solution needs to “respect the integrity of the EU legal order”. That is understood to refer to how customs controls will be enforced between Northern Ireland and the Republic of Ireland. The UK and Irish governments have repeatedly said they do not want a return to customs posts at the border. The taoiseach (Irish prime minister) has described Brexit as being bad bad for the UK, for Europe and for Ireland. Enda Kenny said it challenges Ireland’s peace and prosperity, although the country will maintain its close relationship with the UK. The Republic of Ireland’s economy is particularly vulnerable to any new tariff or regulatory barriers with the UK, which may arise as a result of Brexit. The chief economist of the Irish Central Bank has warned that within 10 years of a “hard Brexit”, the number of people employed would be 40,000 fewer, compared with a no-Brexit scenario. Gabriel Fagan said that some small and medium-sized Irish businesses are “likely to be among the hardest hit by Brexit”. Seán Ó Fearghaíl, the speaker of the Dáil (Irish parliament), said Mr Barnier’s address would be “timely and appropriate” given that Brexit “could have a greater impact on Ireland than any on other EU state”. “As legislators there is an onus on us to be fully informed on the implications of Brexit on this country in particular and on the EU in general and to communicate our particular concerns on Brexit,” he added. Mr Barnier is expected to visit a food production business close to the Irish border on Friday. ← Can corporation tax pay for Labour's education pledge?